Michael T. Swingle (CRD #723350, Clearwater, Florida), who was a registered representative of J.W. Cole Financial, Inc. between August 29, 2007 and November 3, 2016, consented to paying a $5,000 fine and being suspended by the Financial Industry Regulatory Authority (“FINRA”) from acting as a broker or associating with FINRA member broker-firms until November 16, 2019 pursuant to a Letter of Acceptance, Waiver and Consent (“AWC”) #2016051931501 that was executed on May 4, 2018. Swingle was found liable for borrowing from customers without J.W. Cole’s authorization. The AWC stated that Swingle borrowed $118,500.00 from five J.W. Cole customers, three of which were elderly, from August 2014 to October 2016. The findings indicated that $96,000.00 of the $118,500.00 had been lent to Swingle by an elderly couple. Swingle supposedly needed the money because he was in a poor financial condition partly resulting from him engaging in gambling activities; yet, he persisted in gambling after the customers lent him the money. The AWC stated that $102,786.00 of the $118,500.00 borrowed by Swingle has not been paid back. The AWC stated that loans were arranged by Swingle in contravention of J.W. Cole’s procedures. Particularly, the firm was not provided with any notice of Swingle’s activities, and J.W. Cole never authorized Swingle’s loan arrangements before they were effected. Moreover, J.W. Cole’s procedures at the time proscribed Swingle from borrowing customers’ money in any situation. Evidently, Swingle knew about J.W. Cole’s restrictions; he acknowledged it when completing attestation forms. FINRA Department of Enforcement noted in the AWC that FINRA Rule 3240 forbids registered representatives from lending money to, or borrowing money from, customers absent written procedures of the FINRA member firm allowing for it and the borrowing arrangement meeting specific criteria. 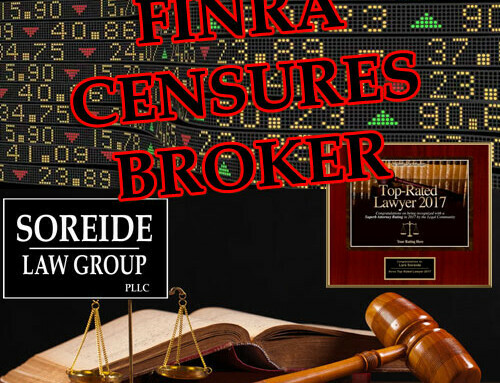 FINRA Department of Enforcement concluded that Swingle had committed a violation of FINRA Rules 3240 and 2010. The AWC confirmed that J.W. Cole terminated Swingle because of his unauthorized activities. If you have experienced losses from Michael T. Swingle or other registered representatives who have borrowed funds from you, contact Soreide Law Group at (888) 760-6552 and speak with experienced counsel about a possible recovery of your losses. Soreide Law Group represents clients nationwide and only charges a fee upon recovery of losses.